Uncategorized Archives - Sunworks, etc. 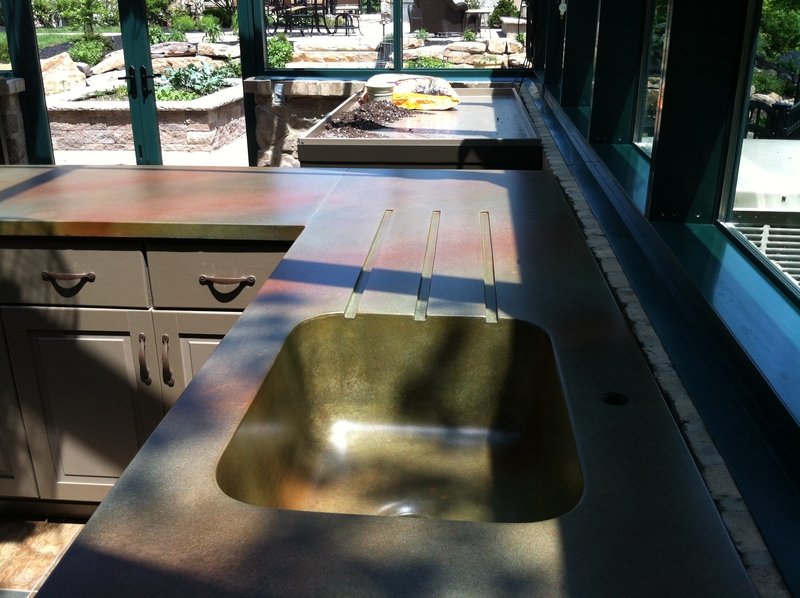 Concrete’s versatility permits features like metal trivets to be added to your countertop design. What are concrete countertop trivets? 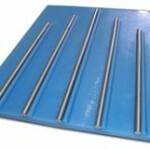 CONCRETE COUNTERTOP TRIVETS are raised metal rods embedded into a concrete countertop surface. What is the purpose of concrete countertop trivets? Concrete countertop trivets are both a practical and aesthetic design element. 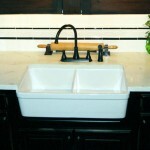 The primary purpose of concrete countertop trivets is to protect the countertop surface. Trivets are made of material that can withstand heat and friction making them the ideal place to set hot items. 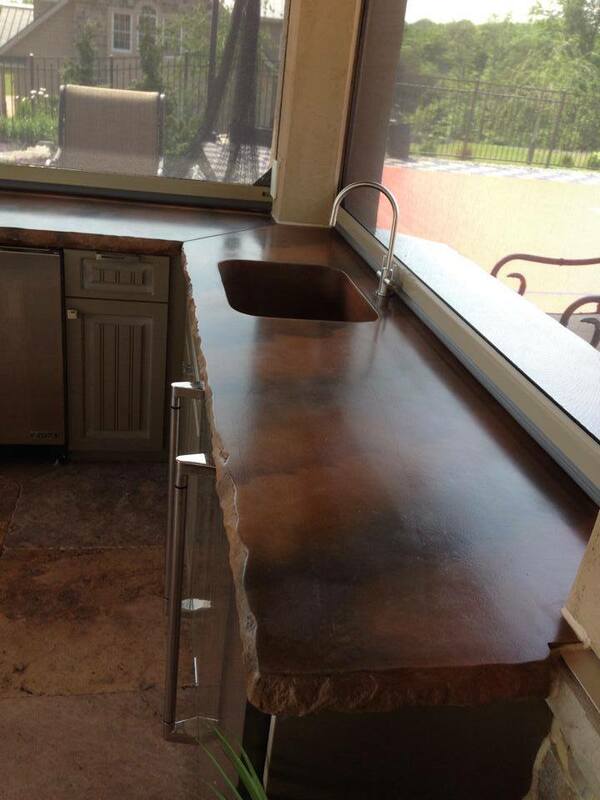 This keeps direct heat off of the countertop surface; helping prevent damage to the sealer. Embedded trivets also provide abrasion resistance to areas where pots and pans are routinely going to be slid across the surface. An additional benefit of concrete countertop trivets is the design appeal. Rods add character to the surface. 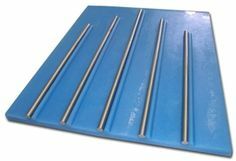 The typical choice for inlayed trivets is simple rods; however, even simple straight rods enhance color and visual texture. 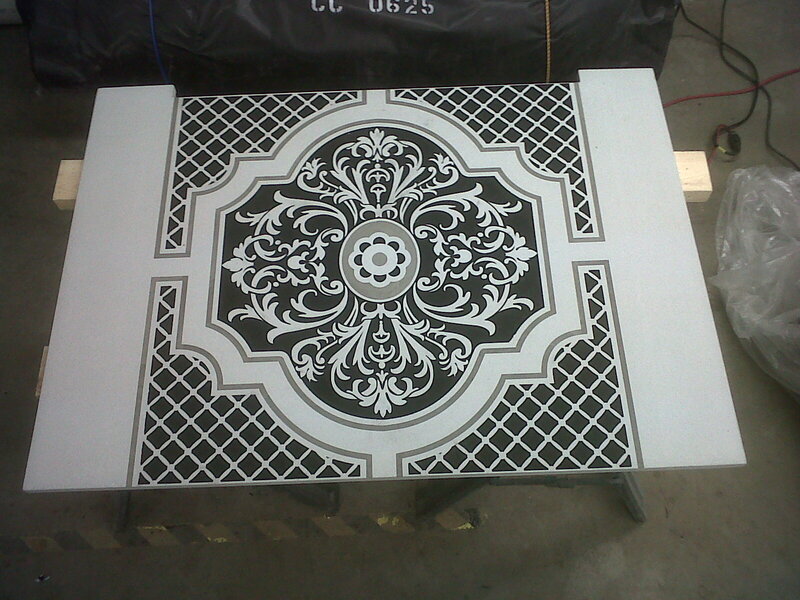 Custom sized and shaped trivets can also be placed in a decorative pattern. 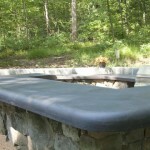 Personalization is a major benefit when choosing a custom-made material such as concrete. Where can concrete countertop trivets be embedded? 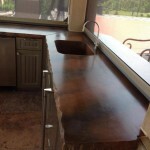 Concrete countertops are handmade to suit your unique needs and preferences. 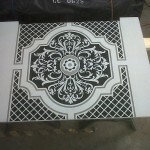 Artisans can inlay metal trivets into your concrete countertop anywhere you would like. May we suggest: by your cooktop to place that heavy cast iron skillet, near the microwave to catch a hot dish, and remember your outdoor eating spots such as near the grill or burner for those hot pots and griddles. Add function and flair to your home with concrete countertop trivets. With concrete, the choices are endless and always yours! SunWorks, etc. is a small local business. We produce authentically custom, handcrafted, unique designs. At the heart of it all, customer satisfaction remains primary and we strive to make each end customer happy. Made in the U.S.A. proud. Stainless Steel Trivet Round Bars Image by Expressions LTD, used with permission. 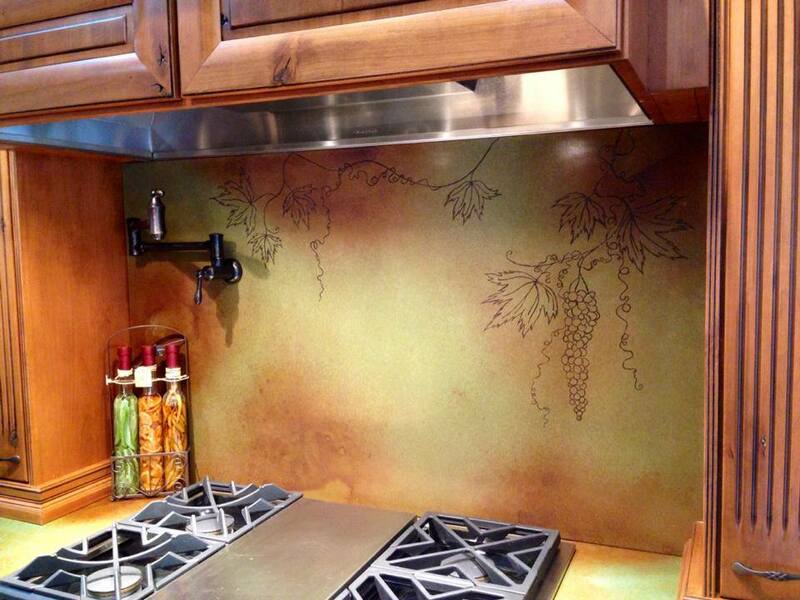 A customized backsplash protects your walls while adding a style statement to your home. A backsplash is a washable material extending behind and above a sink, stove or countertop, which protects the wall from damage. The function of a backsplash is twofold: practical and decorative. 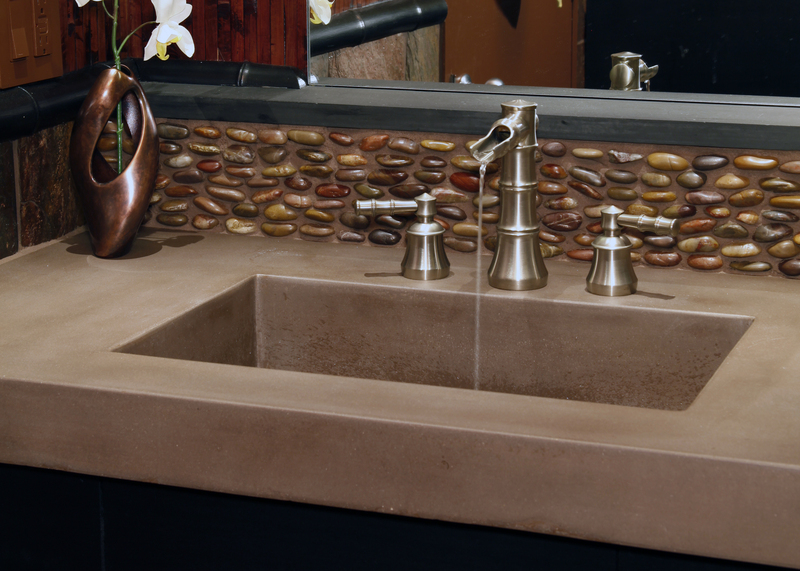 Foremost, a backsplash prevents damage to the wall from water, grease and heat. It also makes the surface easier to clean. Second, it enhances the decor. 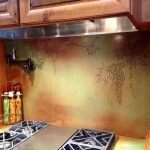 A custom designed back splash adds personality and visual interest to your home. What is the Appropriate Backsplash Size? 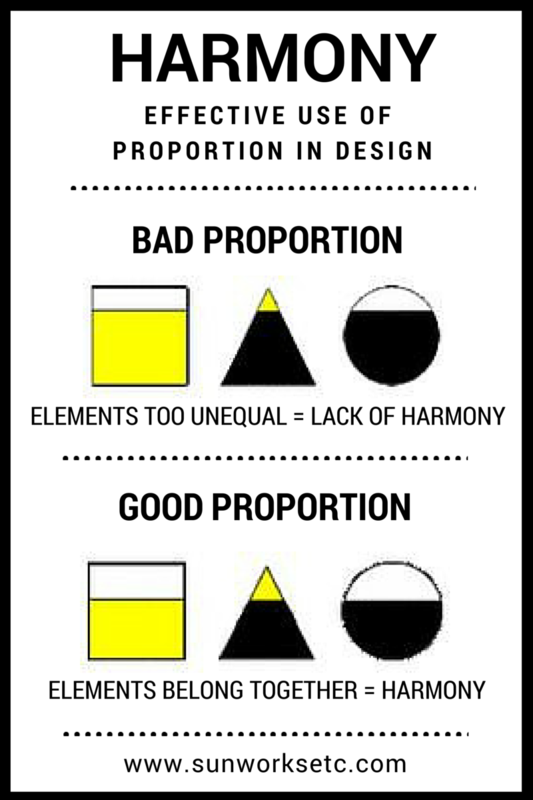 Backsplash size depends on the dimensions of the wall, location, and the homeowner’s preference and budget. 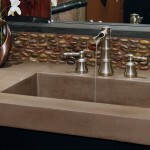 Backsplashes are often a continuation of the countertop;either an integral vertical extension up the wall or an additional piece separately adhered. The standard height of a typical backsplash is four inches; however, custom-designed pieces, such as those from our studio, can be made to suit your particular needs and desires. Larger backsplashes, such as those behind a cook top, ensure maximum wall protection from grease splatters and heat. Ample space also provides an opportunity for a dramatic decor focal point. Why is Concrete the Perfect Backsplash Material? 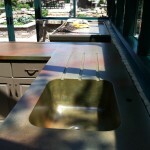 Backsplashes can be constructed from a wide variety of materials. Concrete is heat resistant and waterproof and can easily be cleaned with soap and water. Concrete is a versatile building material that can be customized to reflect your interests or design style of your home. 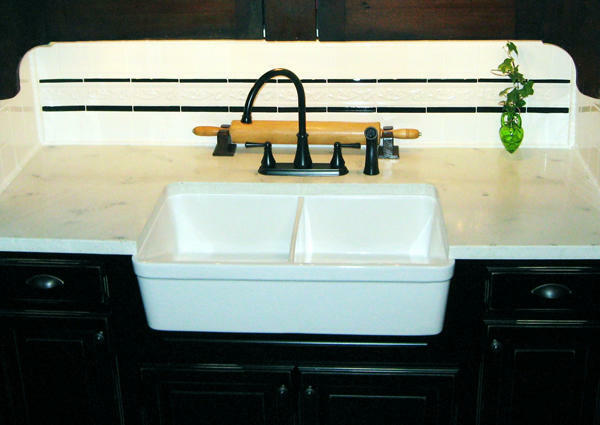 Why Should You Install a Backsplash? We look forward to discussing your home improvement project! Are you busy making Black Friday plans? The holiday shopping season is just getting started. Good news: Small Business Saturday is November 29! In 2010 American Express launched Small Business Saturday too help businesses with their most pressing need — attracting more customers. The day encourages people across the country to shop at small, local businesses, on the Saturday after Thanksgiving. When you shop local, it can lead to big things in your community! Each dollar spent at locally owned businesses returns an average of three times more money to your community than spending at national chains. Local business owners have specific product expertise. They often make their cell phone numbers available. Now that is personal customer service! Small businesses add unique character to a community. Distinctive regional features attract outside investors, enhance your personal satisfaction, and increase property values. Small local businesses donate more resources to local charities and teams compared to big business. Additionally, large firms contribute primarily to the areas where the corporation is headquartered, not necessarily where they do business. Small shops often sell locally made, unique items that are not available at major chains. Please remember our local neighborhood on Small Business Saturday. Shop your local stores and help support your community! A concrete fireplace can dramatically enhance any space. As outdoor temperatures drop, the warmth and glow of flickering flames provides a welcoming gathering place. 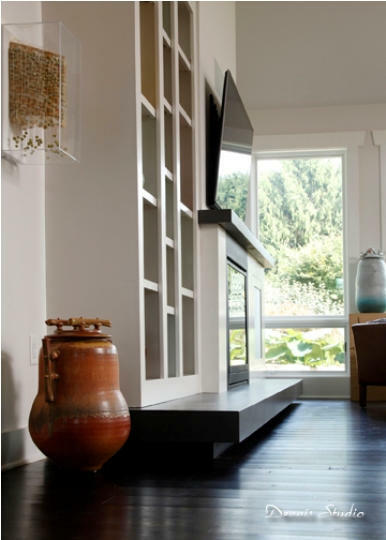 Even when not in use, a fireplace is a room’s focal point. Concrete’s natural properties make it an ideal material for fireplace surrounds, hearths, and mantels. 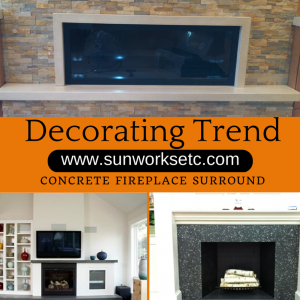 The concrete fireplace is growing in popularity due to concrete’s endless design possibilities. Concrete offers unique style and color options not possible with other materials. Ideal Material. Concrete’s properties make it ideally suited for fireplace surrounds, hearths, and mantels; it is strong, vermin proof, fire resistant, and retains heat. Customized To Any Style. A concrete fireplace is a natural fit in any decor style. 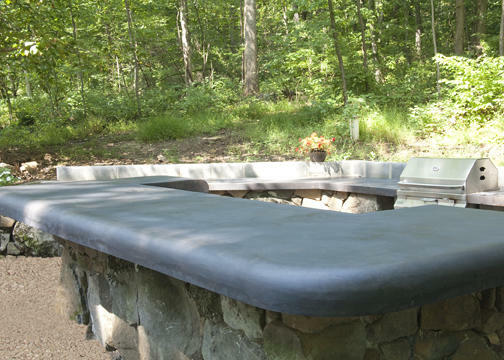 Concrete can be customized to fit all personalities and surroundings. 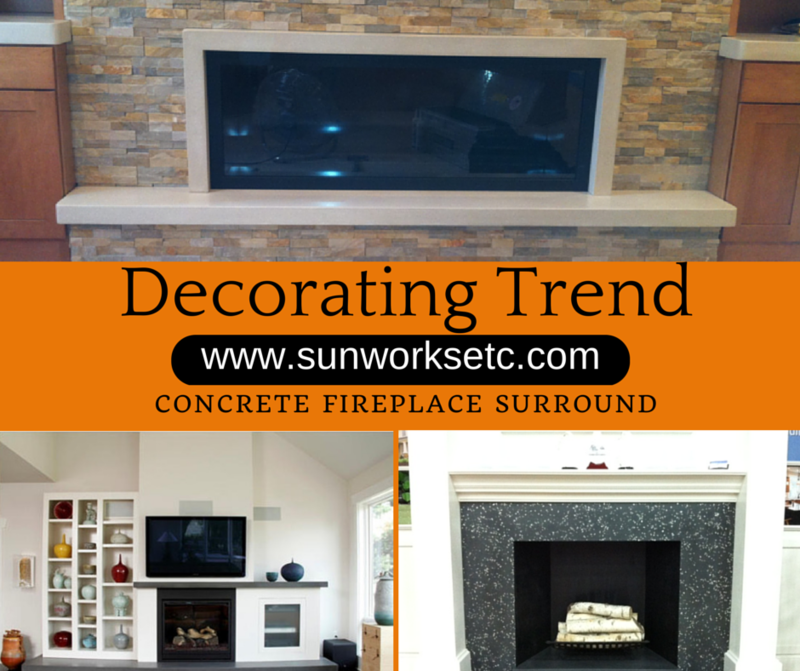 Popular looks in the concrete fireplace trend go from modern, with clean lines and natural finishes, to rustic and aged, incorporating other materials as only concrete can. We had the opportunity to work with an artistic couple to create a one-of-a-kind concrete fireplace surround, hearth, and mantle. For greater dramatic effect, the homeowners asked for a raised hearth that seems to float above the floor, and for the fireplace surround to extend from floor to ceiling with built-in display shelves. About Us. 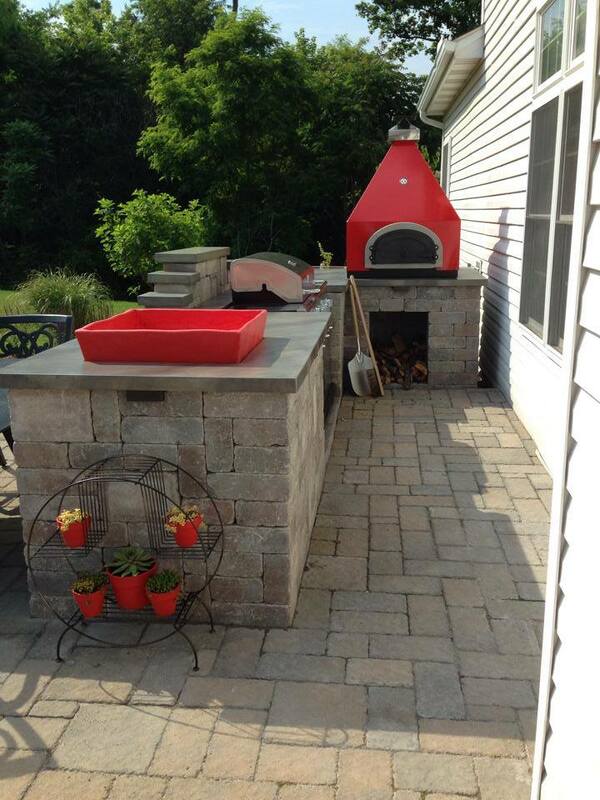 We have passion for decorative concrete. Each of our creations is unique to our client’s personality, vision, and needs. A concrete fireplace is just one example of how concrete can add beauty and warmth to any setting. We are excited to work with you in bringing your design ideas to reality. We offer one-on-one services to ensure that every project is a personalized piece of art. Contact us to start collaborating! SunWorks, etc. LLC is getting some national recognition thanks to an article on The Concrete Network. SunWorks, etc. 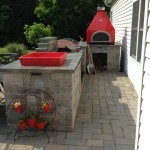 is honored to be featured on the online resource and directory for the decorative concrete industry. 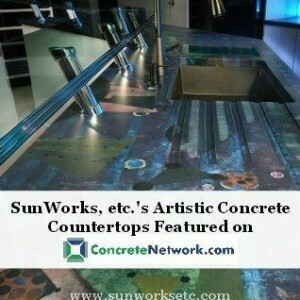 ConcreteNetwork.com educates homeowners, contractors, builders, and designers on popular concrete techniques and applications. Concrete Network is visually appealing, easy to navigate and informative for its visitors. The site has put a lot of work into making it a great resource for both the business owner and consumers looking to purchase concrete products and services. 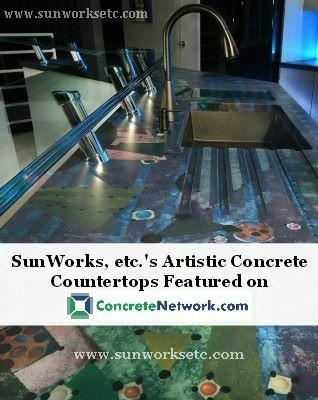 A special thank you goes out to Concrete Network for our business feature article. We appreciate the opportunity to introduce SunWorks, etc. and what we can offer to The Concrete Networks’ readers. We look forward to hearing your thoughts once you have checked out the Concrete Network website!